Sometimes the best way to trade is not via technicals or fundamentals but instead the buy and forget strategy. During the dot com bubble one of my buddies (Will P.) was always talking about Oracle and how great a company it was and blah, blah, blah…So I decided to buy the stock. On Aug 21, 1998, I bought in at around USD 24 and watched it everyday. I watched it hit USD 80 and then saw it crash like Paris Hilton after a night of drinking . After that, I was resigned to the fact that I lost a boat load of cash and decided to just keep whatever was left in the portfolio and not sell. (Click on the chart to see the roller coaster ride). 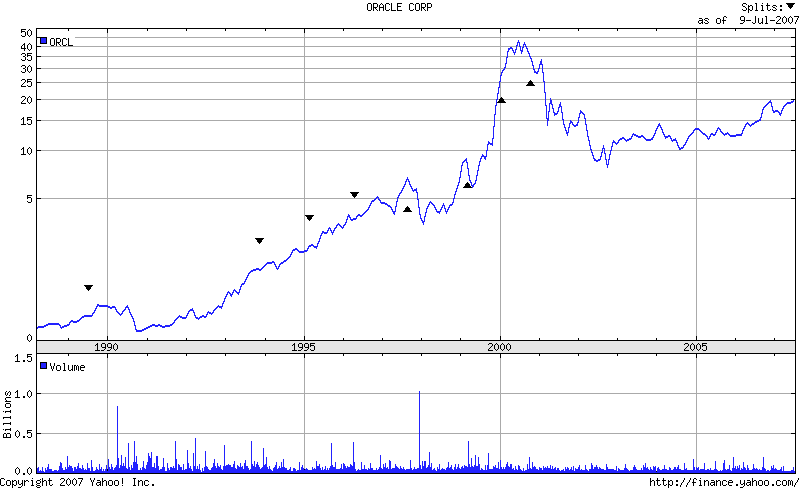 Recently, I was talking to someone and they mentioned Oracle had hit USD 20 which was a 52 week high. In the back of my mind I was still thinking I was USD 3-4 away from break even. But, I decided to check my holdings and my actual cost basis was around USD 4.15 a share. I completely lost track of the shares and it had split several times after buying it. I’m pretty sure if I had tracked the shares day to day, I would have sold out for a 100% profit instead of sitting on a 350% gain as of now. Oh, but don’t get jealous and give me your money to manage. Around the same time, I bought MicroStrategy and currently it’s down -88%. Yes, it’s still in my portfolio as well, you win some and you lose some.